Me: Never trust a woman that can pee standing up! Although I now completely draw a blank about what we were discussing that I was so vehemently compelled to deliver that particular declaration at the top of my lungs, I clearly recall that at that very moment of me babbling, our boss, Elsbeth, entered. I was instantly motivated to hit my mute button and change the subject to floor and wall tile, my specialty in her employ. Before my Lord and Master’s presence pulled the plug on the lively conversation with the Gang of Two (note: our beloved colleagues, The Quiet Man, moved on last fall, and my buddy, Ling, received her Get Out of Jail Free card last Friday), (not) Under Ling (anymore) casually mentioned that she had read in the New York Daily News that tourists rank New York as the Number One city in rudeness. Greg: New Yorkers aren’t rude! They’re aggressive! And sometimes, first thing in the morning, just too damn loud. 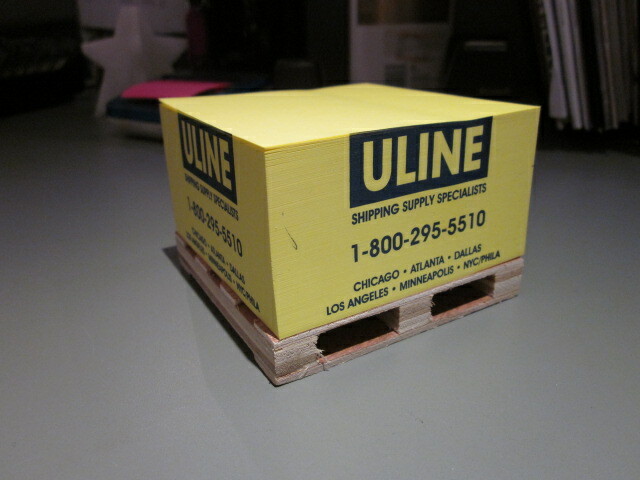 My next career move, gluing sticky notes onto miniature wooden pallets. Lame Adventure 247: Sleeping or Dying? I have not been having a banner week. I’ve overslept every day. I keep missing my regular train coming into the office. I’ve been arriving later than usual. Once at the grind I’ve been fact checking and proofreading a 365 page tome about tile that I fully expect I will encounter again should Hell exist and I become a resident. 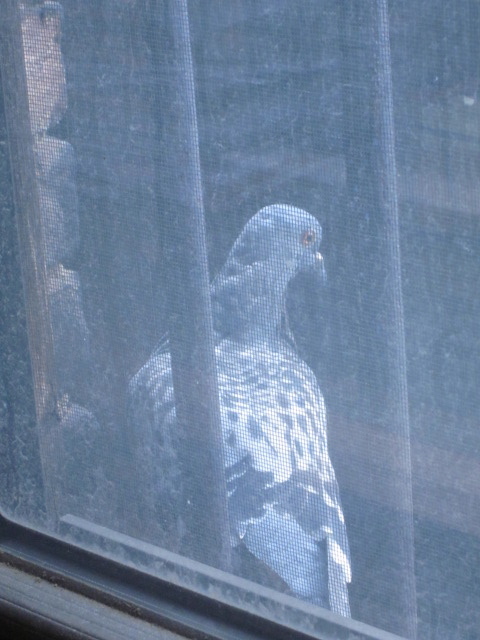 Completely exhausted half a page into my punishing assignment, I remove my glasses, rub my eyes, and when I put my glasses back on, what do I see but this puffy pigeon perched on the ledge outside my window. Me: Do you think this pigeon’s sick or sleeping? Ling gets up and looks at the bird. Ling: It’s not asleep. Its eyes are open. She returns to her desk and the pigeon closes its eyes. Me: Hey, I think it’s asleep now. Ling gets up to look at it again. The pigeon opens its eyes. Me: Wait, forget it. Its eyes aren’t closed. Ling: You should quit looking at it. I take out my camera and start photographing it. Ling flashes the I-cannot-believe-this-stupidity-of-yours look but holds her tongue, her way of ignoring the situation and probably hoping the culprit will go away — the pigeon or me. Me: What if it dies? What do I do then? 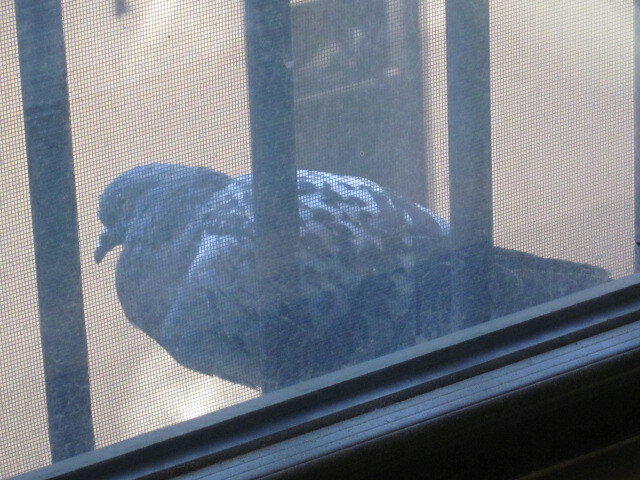 This pigeon is directly in my sightline. 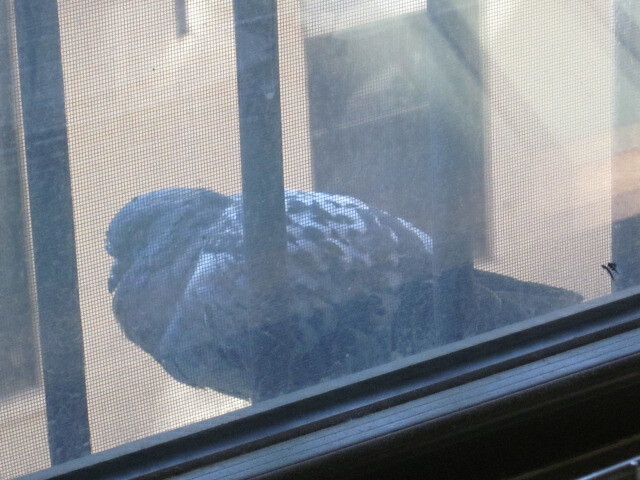 Am I going to be stuck staring at a pigeon corpse rotting on my sill for weeks? I dread that! Ling: Call Jose and he’ll deal with it. Jose is our go-to building services guy. He’s always been someone I can count on. I take a closer look at the Urban Wildlife on the Sill. Me: First, the economy tanks, and now this. Does the suffering ever end? Me: I know that, but I hate to see a creature* suffer. *If it was a rat scurrying on my windowsill, I am certain that my compassion would shoot straight out that window. Ling: Seriously, quit looking at it. Ling: SIT DOWN AND QUIT THE BIRD WATCHING!!!!!!!!!! It flies away. I am elated. I focus on proofreading for the remainder of the day but craving squab. I suffer fresh guilt.